1903 1931 The Henry Richards Tile Co Ltd. W & E Corn moved from the Top Bridge Works, Longport to Pinnox works and were renamed The Henry Richards Tile Co Ltd.
1931 Richards Tiles In 1934 Richards Tiles also opened the purpose built Brownhills works. 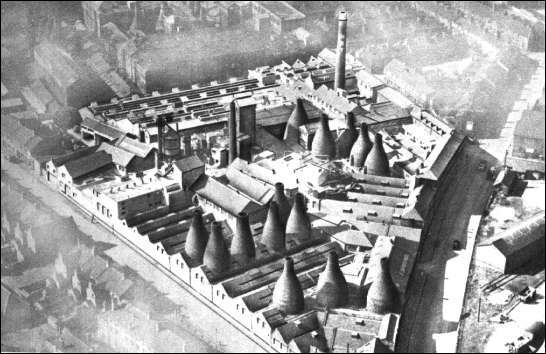 NOTE: it was common for more than one manufacture to occupy sections of the same potworks, hence the overlapping dates. 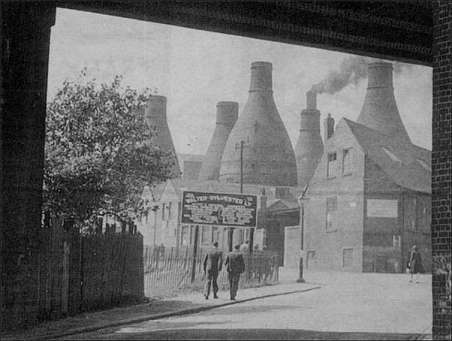 Upon transfer to the Pinnox Works in Tunstall in 1903... "The manufacture of general earthenware was abandoned, and the new plant was devoted exclusively to the production of tiles, except for a small amount of sanitary ware made, until 1925, on behalf of the sister house of Edward Johns & Co.
"In 1911 we entered this field of floor tiles and mosaic when a new factory, adjoining the main Pinnox works, was built and brought into successful operation and, to give us complete control of the grinding of our raw materials, we acquired the Burslem Mills Company. But soon the scourge of war was to check all peaceful progress, and plans for the parent factory had to be pigeon-holed until they could be carried into effect in the early 1920's. From: "Richards 1837 - 1953"
"In 1933 it was realised that the demand for Richards tiles was rapidly rising beyond the point at which it could be satisfied from the Pinnox Works, and it was decided to lay down an entirely new supplementary plant. A large site having been acquired at Brownhills - a few hundred yards from the parent establishment - building operations were commenced in the autumn of the year mentioned, and the new factory was opened in the summer of 1934." The photo is taken looking through the span of a railway mineral-line (the bridge, of which, runs along the top of the photo) the street running to the left (between Walter Sylvesters and the Potworks) is Williamson Street. The Asda supermarket has replaced the potworks and a mini-roundabout has replaced the junction between Scotia Road and Williamson Street. Nearby are still Pinnox Street and Railway Street as a reminder to features now disappeared. "During the late nineteenth century the commonest type of a fatal mine accident was a roof collapse caused by knocking out the pit props with a sledgehammer. 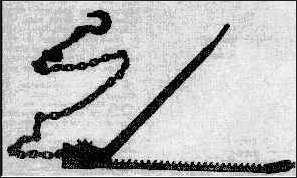 In order to try and counter this problem, Walter Sylvester, who worked for a colliery in North Staffordshire, invented a ratcheted pulling device, which could be attached to the pit props by a long chain and used to haul them out without any danger to the operator. It could also be used for pulling trucks and other heavy items, and tightening-up cables. It was patented in 1895; known locally as a "Walter" it soon became widely used in mining and other industries as the "Sylvester", and was still made under that name until the 1970s. The use of a Sylvester for safety was made mandatory by the Coal Mine Act of 1911. However modern mining techniques eventually made them superfluous, also they could be dangerous if used improperly, and they were eventually banned by the Coal Board in 1978."